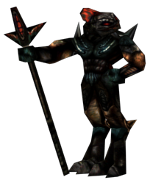 This is an early release of over 30 Unreal 2 invasion monsters for UT2004. The filesize is gigantic because I used full packages from Unreal 2 in order to easily add more monsters later on. The heavy araknids are included, but they are incomplete. The ragdolls and related code were made by Gebsani. The emitters for the Skaarj projectiles were made by Wail of Suicide. static meshes. Milk, if you see this and want me to remove your code, I will do so. I tried several ways to contact you for permission, but nothing ever got through. Thanks to Shaun "Iniquitous" Goeppinger for his great monsters tutorials and the code needed to make ragdolls optional. Credits to him for the Tosc chargeup effect code as well. Legend Entertainment created the models, textures, and sounds that are featured in this pack. Last edited by AlCapowned on 17 Jun 2015, 21:59, edited 2 times in total. I imagine if I were halfway decent at coding, I could have done more about the AI. Any chance this might find it's way to ut99 too? I forgot about this thread. Anyway, I released a new version that fixes some minor problems that the last one had. I like your new userpic; dragon with its tongue sticking out. heh.